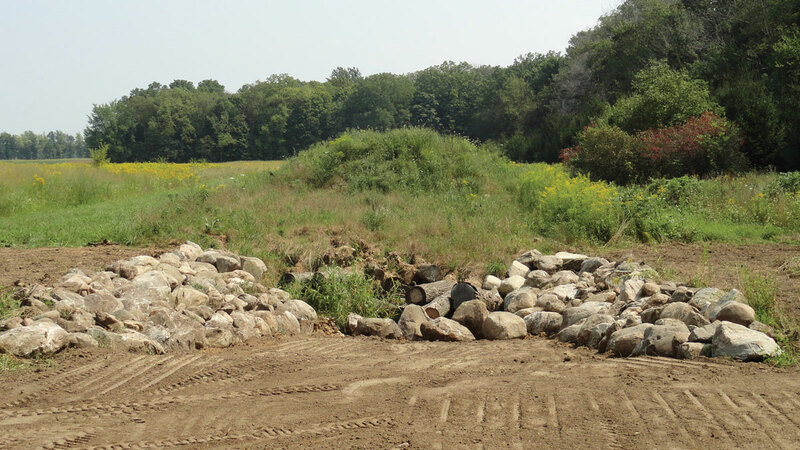 The foundation’s land stewardship team creates a variety of structures to help support endangered wildlife and stimulate biodiversity. One of these hibernacula is particularly large, measuring 25 feet wide by 90 feet long. Designed to accommodate a wide variety of wildlife, two-thirds of the structure is level with the surrounding field, and one-third is built 8 feet above ground. This elevated zone measures up to 16 feet in total height with varying temperature zones from top to bottom. A 30-foot ramp slopes down into the lower level of the hibernaculum, directing rainwater runoff that will benefit reptiles and amphibians. Large stones at the bottom of the ramp help with thermal regulation — acting as a heat sink during the day and providing extra warmth for animals at night. “Because of its size and structure, the hibernaculum can support a wide variety of mammals as well as turtles and snakes. It’s like a huge apartment complex,” says Mike McCuistion, the foundation’s vice president of physical resources. People typically view fire as a destructive force due to the emphasis on fire prevention in today’s society. Yet prescribed burning (planned, controlled fires) is a critical tool to maintain and improve habitats. Indeed, without regular burning, savannas, prairies, and even wetlands will revert back to mixed-hardwood woodlands, the climax ecosystem in southwest Michigan. 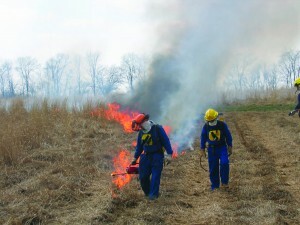 To prevent that from happening, the foundation’s environmental team conducts periodic prescribed burns. This reduces the buildup of dead vegetation, stimulates native grasses and flowers and retards growth of nonnative, invasive plants. The foundation has developed a variety of custom equipment to improve efficiency and safety during prescribed burns. 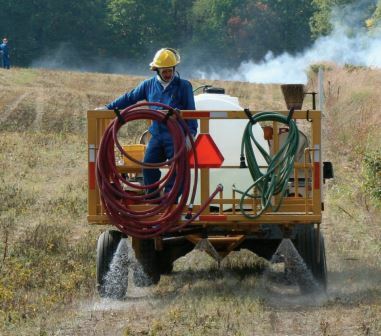 Among these is a field sprayer that has been converted into a versatile fire-suppression trailer and is affectionately known as the “War Wagon” because of the many options it gives burn crew members. The War Wagon features an innovative plumbing system that pulls water from the bottom of a 500-gallon tank into a pump and then distributes it to three different valves at the rear of the trailer. One of these valves has a special fitting to hook up a one-inch fire hose, another connects to a ¾-inch garden hose, and the third valve feeds into a U-shaped line with seven different nozzles. Three of these nozzles direct water beneath the trailer, while the other four nozzles are located on the sides of the trailer and can spray water horizontally. Other equipment developed for prescribed burns includes work platforms that attach to the rear of pickup trucks. Constructed from steel tubing and metal mesh, the 3-by-6-foot platforms have been outfitted with railings, safety chains and step plates to provide safer, more ergonomic platforms for crew members to access hoses and the 325-gallon tanks that are stored on the trucks. The foundation’s land stewardship team has also created a number of vernal ponds to help maintain BRV’s biodiversity. These small ponds measure about 30 to 60 feet in diameter with depths ranging from 6 inches to 6 feet or more. Because these wetlands are fed by intermittent water supplies, such as rain runoff and seasonal springs, they dry up and don’t support fish. Without fish to eat eggs and larva, these ponds are a safe haven for many amphibians to reproduce in. The foundation establishes winter food plots for wildlife to serve as supplemental or emergency food. 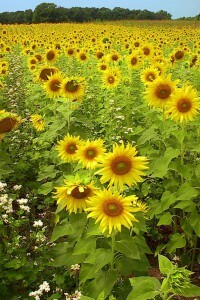 This includes about five acres of standing corn, 3.5 acres of alfalfa grass and 3.5 acres of sunflowers. Strips of wildlife clover, which have been planted around 20 different prairie sites to serve as fire breaks during prescribed burns, also double as food plots. Deer, birds, turkey, raccoon, squirrels and other small mammals forage in these areas; birds especially use the perennial sunflower after it produces seed. In some winters, coyote have even eaten the corn as a food source. In addition, many of the plots will act as cover and travel corridors for the wildlife.